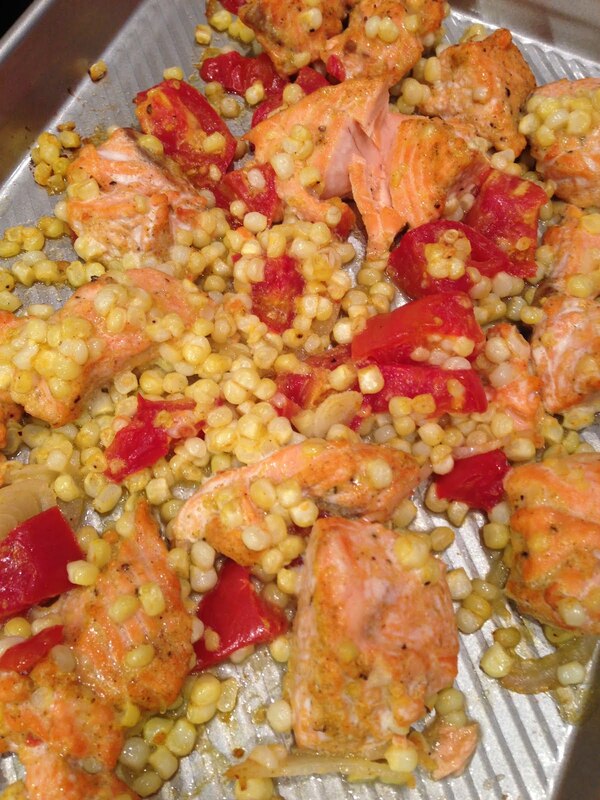 Home corn dinner fish freezer tomato Get some Salmon - while the getting is good! Get some Salmon - while the getting is good! Well, the price of salmon has dropped so I've been making a few special dishes... This first one was from Sunset Magazine - a "slow" roasted curry salmon - so in the recipe it roasts for 9 min? what on earth is slow about that? anyway - I did it my way so here you go. In a bowl toss the mustard powder, curry and salt with the salmon (If you are trying to get kids to eat this try using just salt and pepper - for Mindy ; ) Then toss the rest - shallot, olive oil, tomato and corn into the bowl and spread in one layer on a baking sheet - I have these great little ones that fit in my fancy toaster oven that are non-stick - and roast at 375 degrees for about 10 min. Remove from oven and give it a skwirt of lemon juice - serve on rice or quinoa. Delicious! 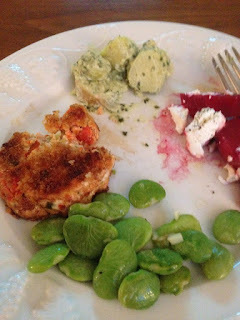 Earlier in this month I made these Salmon Cakes since I had some homemade mayonnaise laying around- and they were delish along side some roasted beets and lima beans - yum. So I decided to grab some more salmon (while the getting is good) and made some more cakes for the freezer - Haven't cooked them up yet - but assuming they will be good - just saute a bit longer when you take them out. In a small food processor whiz up the red pepper and onion until finely chopped then remove to a mixing bowl. Next add your slightly frozen salmon and pulse until finely chopped - chunky but not mush. Put that in the bowl too and the panko crumbs along with seasoning, mayo and juice and mix. With your hands form them into small patties and keep refrigerated or frozen until ready to fry them up. Heat a large frying pan and add a bit of oil and a bit of butter and fry the patties until golden brown about 3 min a side. I liked them plain but they would make a nice salmon burger if you wanted a bun with other fixings like more mayo, tomatoes and lettuce.